This year’s conference will be held at the Chateau on the Lake resort hotel in Branson, Missouri. The Chateau is one of the area’s premiere hotels, offering both beautiful Ozarks vistas and luxurious amenities. While you’re at the conference, take advantage of the hotel spa, enjoy a treat from the snack shop, enjoy the lakefront views at the marina, or go explore the Branson shows! Networking is one of the greatest benefits of attending professional conferences and Pension Focus is no exception. The conference is a great opportunity to build new connections, or reconnect with those you’ve met before. Share your experiences, learn from, and grow with others as you take in the latest in industry information. This year’s speaker line up represents a significant breadth and depth of industry knowledge. Attendees will hear from our keynote speaker, Global Editor-in-Chief of PLANADVISER and PLANSPONSOR for Asset International, Alison Cooke-Mintzer. Experts in employee benefits law Brandon Long, John Utz, and Keith Peters will offer their perspectives on current legal issues and regulatory updates. Industry research specialists Dr. Rui Yao, Dr. Raife Giovinazzo, and Chris Thixton, QPA, will present on current trends and projections for the future of the industry. And, as an added bonus, Southwest Missouri television personality and 4-time Emmy award winner Jeff Houghton will serve as Master of Ceremonies. The topics at this year’s Pension Focus conference were hand-picked to bring you timely and practical information geared toward retirement plan performance. General sessions will offer perspectives on performance in the retirement planning industry as a whole, current and coming trends, while special breakout sessions will offer interactive learning opportunities for attendees. The shift from subjective measures of success to objective performance will feature prominently throughout the conference, from the opening session to the keynote address. Bonus: The conference will close with a roundtable discussion where attendees can ask both conference-specific and plan-specific questions and hear from conference speakers and industry experts on topics concerning retirement plan performance. 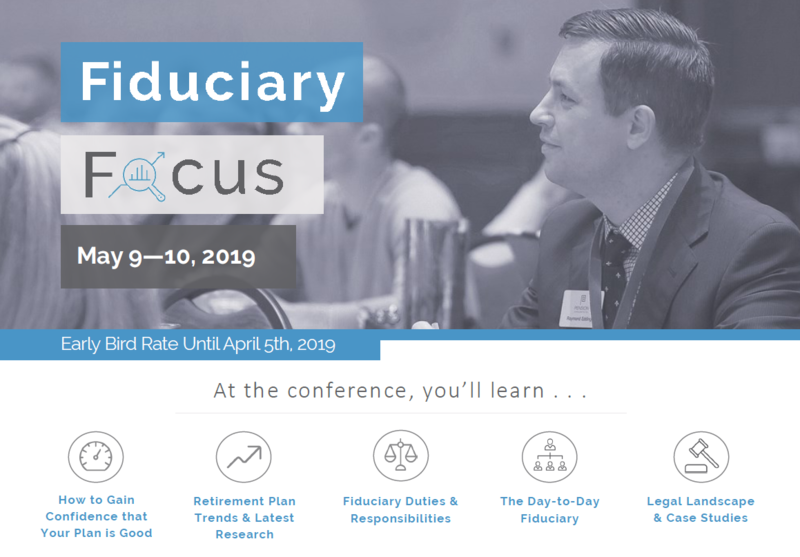 Designed specifically to educate retirement plan sponsors and fiduciaries working with corporate sponsored retirement plans on how to deliver a top-performing plan, Pension Focus has been equipping fiduciaries and plan sponsors for more than 20 years. This year, the conference is zeroed in on one thing: Performance. It’s time to go beyond the charming smiles of your vendor relationship managers and the flashy website tools or glossy print education materials. You need more than the memorized ERISA bullet point items that begin each retirement plan committee meeting. Join us at Pension Focus 2018 for two days of education and workshops that will give you the tools you need to understand – and improve – your plan’s performance.